Yes, please! This festive and tasty idea from How Does She! would be so fun for Christmas parties! It is the little things that make events memorable, don’t you think? 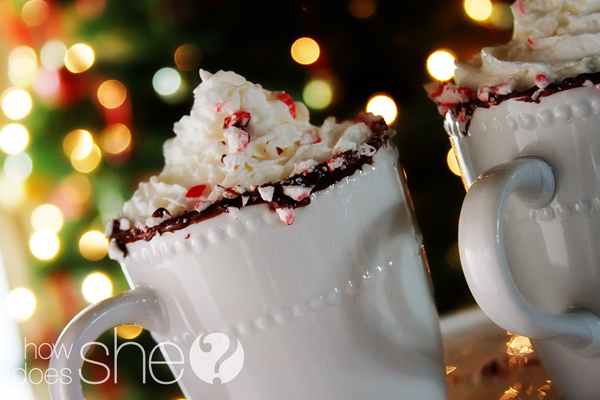 Peppermint Rimmed Hot Chocolate would make a great winter tradition for your family, too! Your kids will never forget family treats like this. I thought this similarly festive idea for decorating a beverage glass from Hey Gorgeous was super neat too! My girls are always adding sprinkles to things, so I know they will love this. 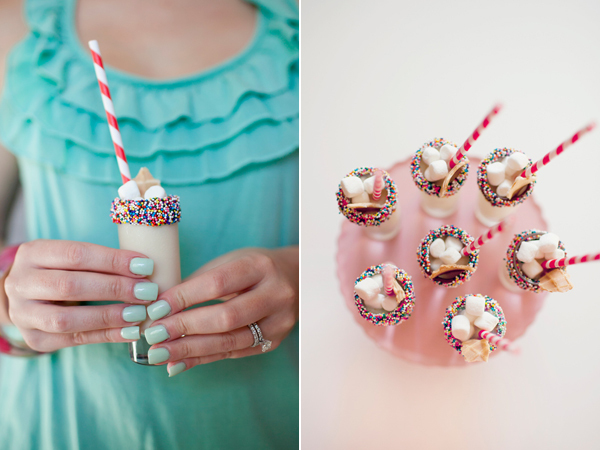 Can you imagine how great this would be to dress up ice cream after dinner or milk glasses at the kids’ holiday table? I found some cute straws at Garnish so you might want to have them on hand for the holidays (they are not an affiliate, although I do love their products)! Too cute not to share! Happy weekend! The peppermint hot chocolate looks yummy. What a great treat after the Santa Claus parade or ice skating. Almost makes me want winter to come – almost. That is such a cute idea. Isn’t if funny how one idea can inspire a whole chain of ideas – couldn’t you see a tobogganing party that involved bowls of chili, roasting smores, and these fun cups of hot chocolate. Thanks for the introduction to Garnish! So yummy….I could SMELL the aroma of peppermint!!!! Yummy! My son would love this- great idea! My mouth was watering to taste the chocolate peppermint on the rim of the cup! My kids would love this! Thanks for sharing some wonderful ideas for unforgetable holiday memories! Oh that hot chocolate looks delicious. The peppermint cocoa and the sprinkle/chocolate rimmed beverage look amazing. I love peppermint this time of year, yummy. Don’t you just delight in this season?! Even though I’m not a huge fan of peppermint, peppermint dust can bump so many things up to the next level! Love this idea – Such a festive treat! Hi! : I’m from Argentina .I love looking for blogs in my computer. I cook cupcakes and cookies to sell so I’m always looking for new things .Cupcakes are new in our culture and people are just starting to know it, but i love them. I love your site. it’s really nice and transmites the love you feel for your family and how you enjoy with them.